Say 'Hello' to Christmas and New year Sticker for iMessage. What better way to brighten up someone's day than with this little cutie? ●●● 40 unique stickers ●●● ●●● Big SALE 50% OFF for a LIMITED TIME: Buy once, FOREVER fun!●●● FEATURES: ● Buy once, FOREVER fun: You'll have all you need, NO additional pay, NO In-app purchase! ● Easy to use! 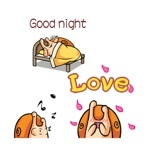 Tap or DRAG & DROP the sticker into your message. ● All stickers have been optimized for retina display and to perfectly fit into your iMessage.